I must start by saying, this craft was inspired by the popular melted bead suncatcher as many of you will have seen on Pinterest and over the net. I just couldn’t resist having a go and adding my own individual touches to it so I hope you enjoy reading. Step 1. Choose a baking tin. I started by exploring the different sized baking tins that I could find in my messy kitchen cupboard. I found a cupcake and Yorkshire pudding tray to be most effective because they didn’t require too many beads but still were of a reasonable size. 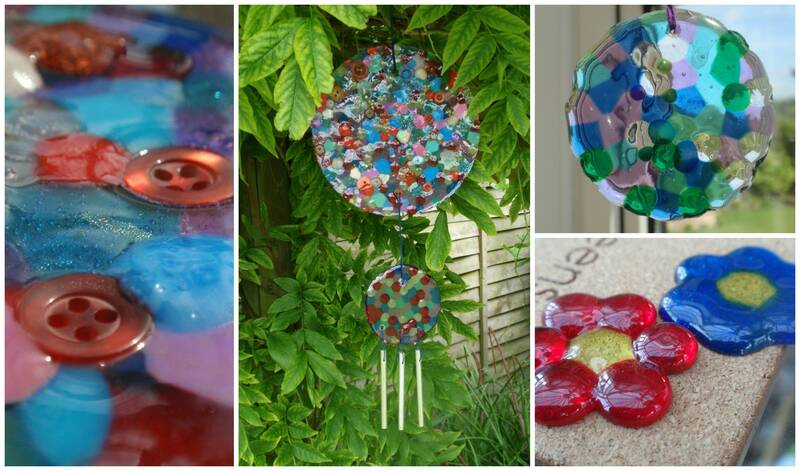 I also used a normal sized cake tin to create a large suncatcher. Step 2. Arrange the beads in the baking tray, avoiding large spaces. A lot of the sites suggest using pony beads and these are great as they are available in lots of shops and look very effective. BUT I thought I might try something different. I used a variety of different sized, shapes and translucency beads. Most cheap plastic beads are great so see what you can find. Try and fill your tins as much as possible to avoid holes in your suncatcher. Step 3. Turn on your oven to Gas mark 6/400°F and cook for 20+ minutes. Different beads take different amounts of time to melt and you may want to explore different effects. The longer you leave the beads in the oven, the more they will spread. So after 20 minutes, just keep checking until you are happy with it. Step 4. Drill a hole into your finished design and hang with using thread or string. Do not use hamma beads: I have learnt this the hard way. They stick to your baking trays and do not jell with other beads. Try including buttons: I included buttons within my designs [surprise, surprise] and although they didn’t melt, I was very pleased with the overall appearance of the design. They also came in very handy when threading the suncatcher as I just used the holes of the buttons. If you placed these strategically, this would prevent you having to drill holes into your design later on in the making process. Create texture: Another thing I discovered, if you add beads at a later stage in the cooking process you get some fab textures and interesting effects. Make a wind-chime: I bought a cheap wind chime from the 99p store and after drilling holes into my design [where buttons had not been included], I attached the chimes using thread. This particular design is for my Mum’s birthday and is meant to match the blue and red stain glass we have in our house. I hope she likes it! We ran out of clear beads as the cake tin was so large but I like how all the different beads capture the light. Create melted flower keyrings: These simple, melted bead flowers were good fun and easy to create. Just arrange a few beads on a baking tray and pop into the oven. I’m sure you could make so many different shapes and designs. After drilling a hole in them, I made them into keyrings and even became a fashion accessory for an eager volunteer.